Astaxanthin Gold features a natural, pure source of astaxanthin extracted from Haematococcus pluvialis using a patented, supercritical, solvent-free process. The AstaReal® extract used in Astaxanthin Gold is the world's most studied brand of astaxanthin, and aids skin, immune, and eye health. 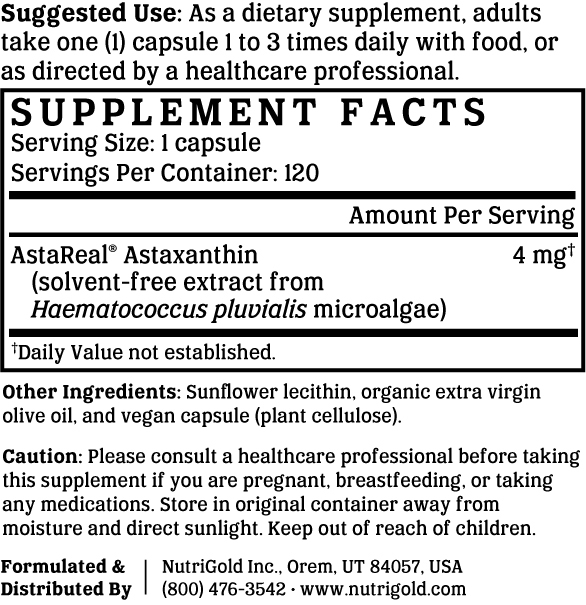 Astaxanthin Gold is manufactured in the USA to industry-defining quality standards and is verified by independent third-party labs to meet identity, purity, and potency label claims. A member of the carotenoid family, astaxanthin is one of the most powerful lipophilic antioxidants yet discovered. Its antioxidant capabilities have shown to be up to 6,000 times more potent than vitamin C, 800 times more potent than CoQ10, 500 times more powerful than vitamin E, and 75 times more potent than alpha lipoic acid. Unlike some carotenoids, astaxanthin does not convert to vitamin A (retinol) in the human body, and thus does not pose the risk of toxicity that is associated with high consumption of vitamin A. The high level of antioxidant activity found in astaxanthin indicates an increased ability to help support the many age-onset conditions related to oxidative stress. The AstaReal® extract used in Astaxanthin Gold is taken from Haematococcus pluvialis, a form of microalgae that produces the bright red carotenoid when exposed to sunlight. Because H. pluvialis naturally produces astaxanthin when exposed to UV light, the astaxanthin in this product is extracted using a solvent-free, supercritical, carbon dioxide process. Supercritical extraction methods are preferred for astaxanthin extraction because the highest achievable concentrations in the extract when using organic solvents (e.g. acetone) are actually lower than what would be achieved without the use of such solvents, at least in the case of astaxanthin. It is hypothesized that this is because of the composition of H. pluvialis microalgae, as it contains astaxanthin and some lipids, both of which dissolve readily in organic solvents like acetone. Consequently, astaxanthin cannot be selectively separated from the lipids and standardized to higher concentrations using a solvent-based method. Conversely, much higher astaxanthin concentrations can be achieved with the supercritical carbon dioxide process because of the flexibility to manipulate their dissolving power. Because lipids and carotenoids respond differently to supercritical carbon dioxide and can be selectively separated, it is possible to achieve an extract that is selectively high in the carotenoid, rendering the use of solvents unnecessary and inefficient. Astaxanthin Gold is Non-GMO Project Verified, which provides assurance that the product has been manufactured in accordance with the best practices for GMO avoidance. The Non-GMO Project is North America's premier verification program. Most consumers consider kosher products to be cleaner, healthier, or better than non-kosher products. The Ko Kosher symbol on Astaxanthin Gold is assurance of our brand's unwavering and uncompromising commitment to accountability, quality, and overall safety. We like to make supplements that can be enjoyed by everyone. That's why our products are always compliant with the best practices for avoiding allergens and minimizing cross-contamination. 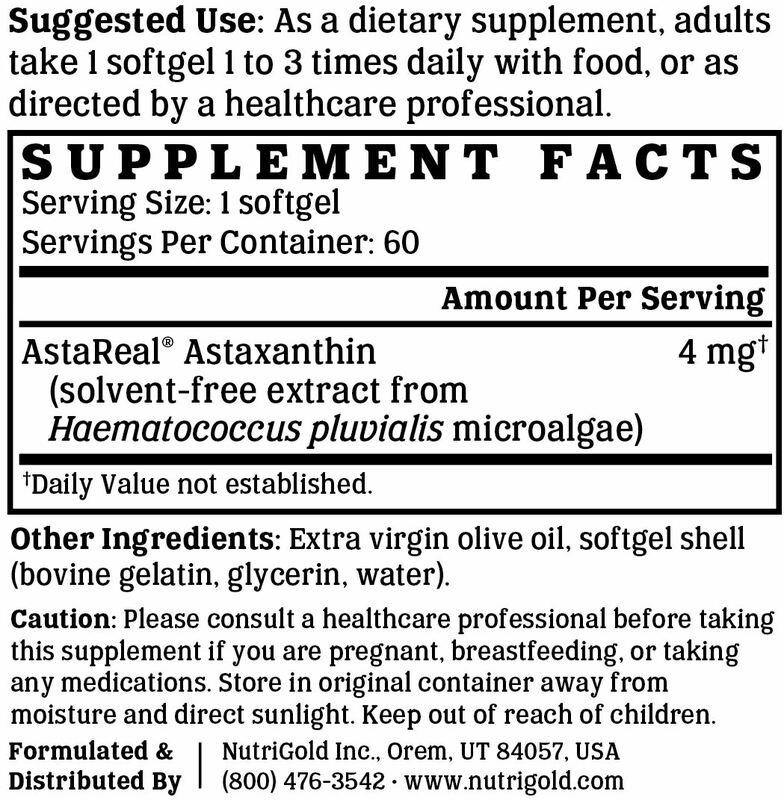 Astaxanthin Gold is free of soy, gluten, egg, milk, peanut, shellfish, and corn allergens. Consistent with our guiding principle to “do no harm,” Astaxanthin Gold is manufactured without the use of additives or preservatives. It contains absolutely NO contaminants, pesticides, herbicides, harmful additives, residual solvents, magnesium stearate, or hexanes. Like all NutriGold products, Astaxanthin Gold is subject to over 140 purity and potency assays by independent, third-party labs to ensure that the product meets or exceeds its claims. So, you can be certain that what's on the label is what's in the bottle. Nothing more, nothing less. No articles featuring Astaxanthin Gold have been published yet.